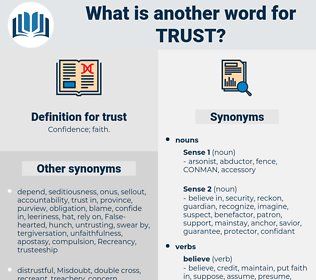 What is another word for trust? auditors, merits, individuals, holdings, awards, lays, indenture. confidence, credibility, trustee, self-confidence, trusteeship, reliability, loyalty. doubt, disbelief, mistrust, uncertainty, distrust. consternation, dismay, bashfulness, disillusion, uncertainness, dubiousness, disenchantment, shyness, timidity, disillusionment, confusion, hesitancy. hold, reject, disbelieve, abstain, know, keep. impede, borrow, obstruct, oppose, hinder. Do I not trust you? She passed him at once with the words, not looking at him, for she could not trust herself. discretionary trust, savings account trust, active trust, spendthrift trust, Totten Trust, direct trust, savings bank trust, living trust, Inter Vivos Trust, charitable trust, implied trust, passive trust, trust account, testamentary trust, express trust, voting trust, public trust, trustee account, Clifford Trust, grantor trust, blind trust. credit, reckon, bet, depend, look, swear, lean, count, rely, calculate, bank.